Awhile ago, I was invited to a potluck. My game plan was to make a bottle of sharbat and a batch of shami. Sharbat, I’ve introduced to you before, and shami is a minced beef & chickpea-flour fried-patty concoction (there are other variations as well) that I’ve been in the habit of eating infrequently here and there – with bread and yogurt and pleasure – but had never heretofore rolled up my own billowing, soozan-doozi adorned sleeves to make myself. I’d dug up an easy-to-follow recipe and shami itself is quite simple (borderline plain) in semblance, so really, how hard could it be to make? Answer: very hard! At least for moi. A series of gaffes and oopses and faux pas led to a certifiable and somewhat excruciating disaster. In retrospect and in hindsight and in my defense, the recipe was somewhat wonky and I should have looked up Turmeric & Saffron’s recipe or asked for my mother’s instead. This line of rationalization though reminds me of a very awesome Ziggy cartoon when he goes to the “Complaints” window of a department store and says: “I’m too short.” Ha ha! It also puts me in mind of an Iranian proverb (zarb ol massal) which goes: “The bride can not dance and claims the room is crooked!” (Aroos nemitooneh beraghseh migeh otag kajeh.) Used when one blames circumstances for what is inherently one’s own fault or shortcoming. OK, OK! I admit it! I am a horrible and deeply flawed shami-maker! Are you happy now? Seriously — who knew it was so hard to make the shami patties look so perfectly round and composed? Shami as it’s meant to be! Beautifully made by Gholi joon, a dear family friend. In my hands (too much grated onions were among my other sins so the patties were too loose) instead of turning out as good, solid, well-rounded citizens, the shami patties were coming out lopsided and crooked and entirely strange — looking much like the type of person you avoid sitting next to on the subway. There was no way I was going to show up to a foodie potluck with a plate-full of these creatures. So as a last-minute panicked plan B, I rushed to make a batch or two of the banana nut chocolate chip muffins that had turned out quite nicely when I’d made some for the half-birthday of a special quelqu’un. 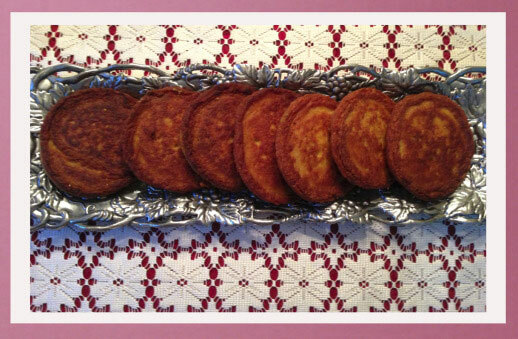 I also decided to Persianize the recipe so as to make it a more special and personal offering. That is to say, I added a touch of pistachios, saffron,rosewater, and the teeniest hint of cardamom to the mix; topped with crumbled dried rose petals for a pretty flourish. The original Evelyn’s Coffee Bar / Epicuruios / Bon Appetit recipe for the muffins is a very good one — it’s a keeper, I love it and heartily recommend it — and fortunately, the recipe withstood my glamming up efforts and took well to its Persianization! I was a tad bit apprehensive about mixing milk and mashed bananas and chocolate chip bits with rosewater and cardamom, but ultimately, the Persianizing ingredients were used sparingly enough to just give the entire thing that je ne said quoi air of being Persian without interfering with the natural goodness of these moist, delicious and cake-like muffins. Gotta love these muffins! They are delicious comfort food and in pinch, when shami shames you, they let you save face! Add ground cardamom and a handful of coarsely ground pistachios to the dry mixture of sugar, baking powder and salt. Add rosewater and dissolved saffron to the moist mixture of mashed bananas, egg, melted butter and milk. 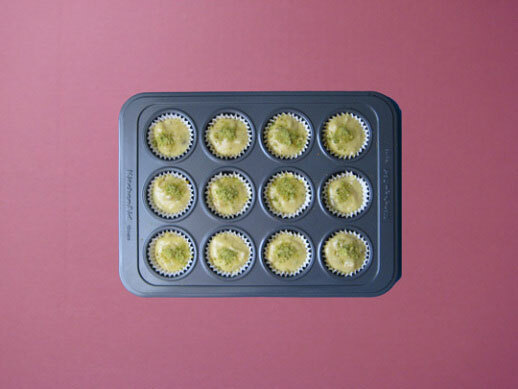 Halfway through the baking process, top each muffin with a sprinkling of ground pistachios. Once muffins have cooled off on the rack, sprinkle with crushed rose petals. Note: The baking time for me is around 15-17 minutes and not 30 minutes as indicated in the recipe. Perhaps this is because I preheated for more than half an hour and used a mini muffin pan, but Just to be safe, I recommend you keep a watchful eye when baking a batch the first time around to figure out your optimum baking time. The Shami sound really delicious and I share your frustration when things just don’t turn out as you hoped. It’s happened to moi many many times. But the muffins were delicious, perfectly moist, the saffron, cardamom and chocolate were beautiful together. Totally loved your fusion muffins. Fusion muffin!! Love it. The perfect term! I may steal that Suzanne! And I’m relieved to hear the cooking plans gone awry happens to even a cook as accomplished as you. Of course you can its yours to do with whatever you want! You know rabirius, they were pretty good, I’ll be immodest and say! This is gorgeous. The combination of ingredients sounds divine. The combination of the Persianizing ingredients (cardamom, saffron, rosewater, pistachio) is a classic ancient combo trademark of Iranian cuisine – and surprisingly (nicely so) it seems to adapt well in “fusion” (my new favorite word!) with the Western cuisine. thank you for visiting Amanda! I love eating food that tastes of fruit and flower gardens. This looks beautiful. Azita, I think anything you make is beautiful… always enjoy your posts. Thank you for sharing this. Azita, Only you can make a muffin look so elegant princess-y, arriving with rose petals on its head and at its feet. Gholi joon’s shamis look pretty dignified too! Fae, it was a culinary emergency and I had to pull out all the rabbits I could out of the hat and thank God I had the rose petals etc. I didn’t get to taste those shamis that Gholi joon made but I heard tales that they were exceptionally good. Wonder if you’ve ever made shami? Shami shambles! A new phrase to love! Cool way of putting it and yup, I swear that’s how it all turned out. A big reason it turned out well is that I do think that recipe is quite solid and reliable and it’s so easy as well. I fully recommend it. Your muffins look superb. Can’t seem to get mine to rise equally or to get them all the same size. Anyway, with bananas I’m sure those extra flavours, used sparingly, would work an absolute treat. Johnny, give the original recipe a try, I think you’ll like it, and I’m a super novice baker and yet it works for me – reliably so for a few times now. And thank you, I’m so glad you liked that line. Love that! What a lovely idea to add cardamom and rosewater! I must try this, as I make banana muffins/bread so often that I get a bit tired of them. A very lovely addition to a basic banana bread recipe. What a creative touch. Perfect Plan B. Thank you! It was such a relief when it worked! Thank you! 🙂 The dried rose petals are a nice touch, I will say so myself, but only because I did not come up with the idea of using those and they’ve been used traditionally to garnish Iranian food throughout the ages. Judging from the picture, your muffins must taste great especially because of the Persianization ingredients. 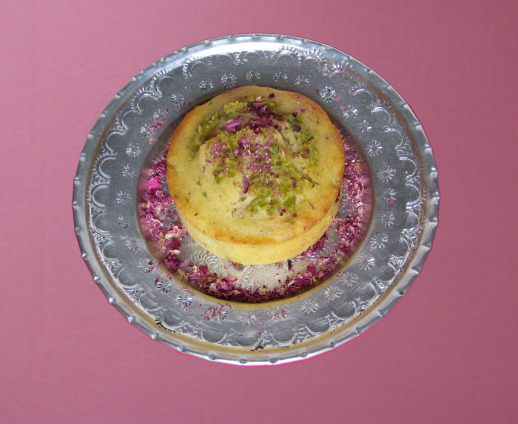 How did I miss those pretty Persian style muffins in my life? Glad that after all it turned out fine for you. =) Need to try your recipe some time soon. Cheers! I Persianize most desserts and I’m not Persian – I just love the combination of flavours, it gives even the simplest of recipes sophistication and just something else! Your muffins look delicious! I made your divine muffins & loved them so much! Yum Yum Yum,…it was!